You have choices - and they're all great! 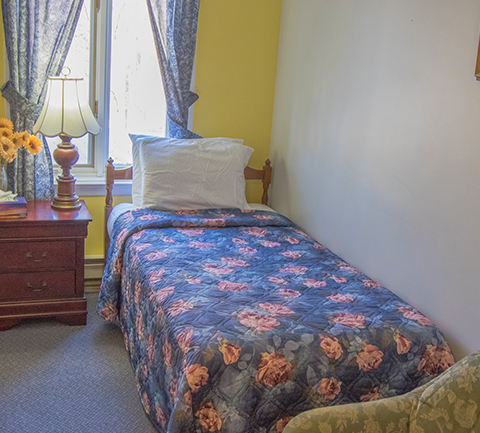 You will enjoy your stay in the beautiful town of Pictou in one of our comfortable rooms or suites. We look forward to hosting you and describing some of the sights and events that are happening here. All room rates include a free continental breakfast. We welcome guests for Check-In anytime after 3:00pm. Check-Out time is 11:00am. All rates are in CDN dollars and do not include applicable taxes. Payment may be made by Debit, Visa, MasterCard, American Express or Cash. Cancellation policies vary according to room type. Please check the room conditions when selecting your room above. Children are welcome: All children under 10 years stay free of charge when using existing beds. Pricing may vary during local special events. 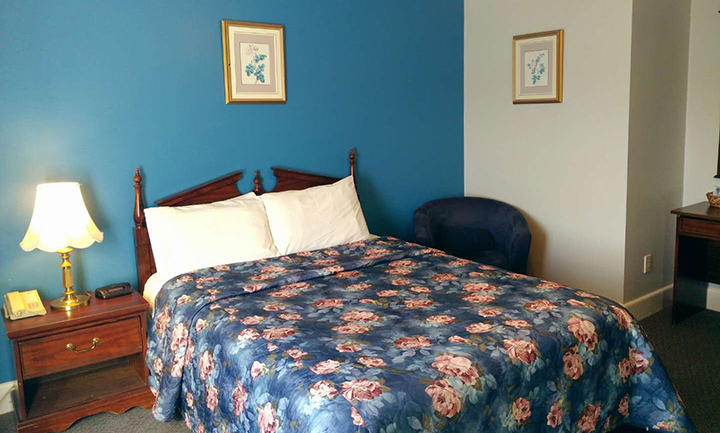 All older children or adults are charged CAD 15 per person per night when using existing beds. There is no capacity for additional beds. Full refunds will be given provided notice of cancellation is given more than 3 days before expected arrival. For cancellations within 3 days, our policy is to charge for a single night's stay. We have on-site laundry facilities available. Free public parking is available on the property. We have free high-speed wireless internet. We operate a NON-SMOKING property, but we do have an outdoor designated smoking area. Unfortunately, we cannot accommodate pets in our Country Inn. Our suites are a popular selection. You may want to come back to your room to watch a little bit of television, but you'll love coming back to enjoy a nice soak in the whirl pool bath. The room warmly decorated with warm colors and local photos. We want you to feel cozy. 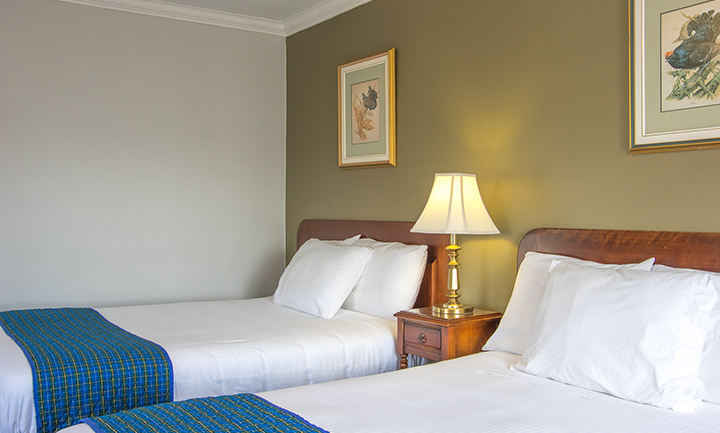 Our beds have nice fluffy pillows and the firm mattress that means you'll have a pleasant sleep. King rooms feature harbour views. They contain one king bed, a private bathroom with a hair dryer, satellite TV and free WiFi. Each of these rooms has it's own closet, a desk if you require a work station, air conditioning, a ceiling fan, a telephone, an alarm clock, replica antique radio, and a chair to sit and enjoy the view. 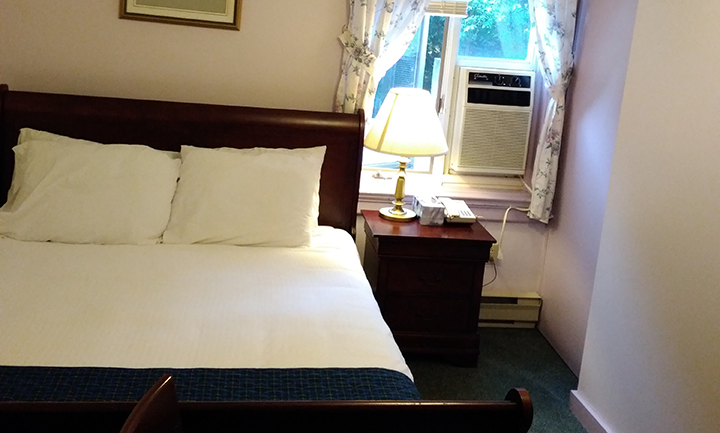 Standard queen rooms feature one queen bed, a private bathroom with a hair dryer, satellite TV and free WiFi. Each of these rooms has it's own closet, a desk if you require a work station, air conditioning, a ceiling fan, a telephone, an alarm clock, and a chair to sit and enjoy the view. Most queen rooms have a harbour view. This room consists of two adjoining bedrooms with an en suite bath. 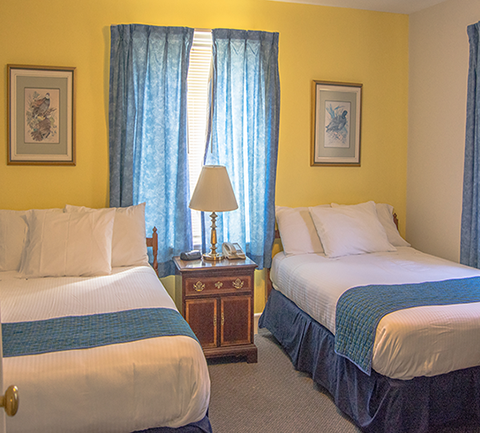 The larger bedroom has two double beds with a flat screen TV with satellite service as well as an armchair and closet. 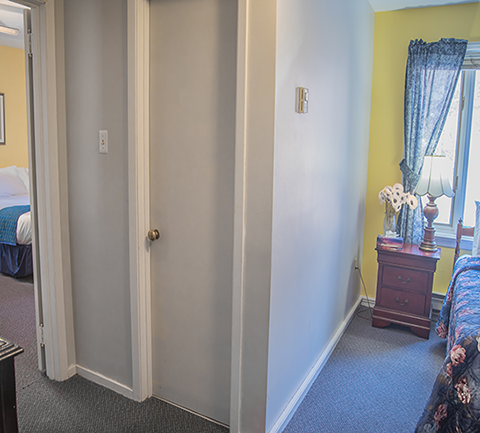 The smaller bedroom has a single bed, an armchair, a dresser and refrigerator. This room has a hair dryer, bathtub with shower, air conditioning and two ceiling fans. Note: Rate is applicable for 3 People. Add $15 for each extra person. 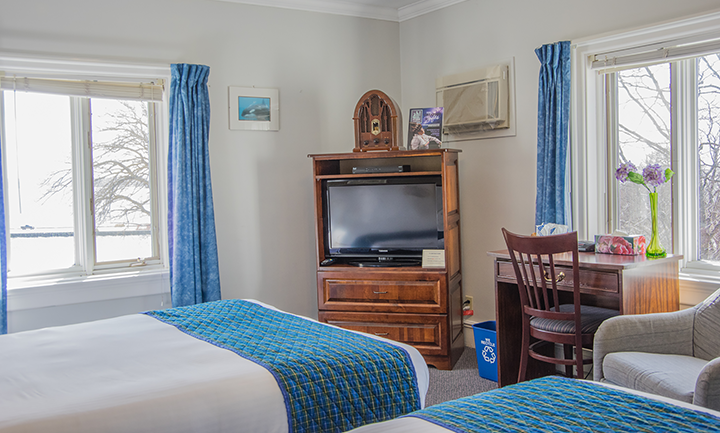 These rooms offer a view of the harbour and feature two double beds. All of these rooms include a desk if you need a work space and have flat screen TVs with satellite service and free WiFi. These rooms also offer an en suite bath with a tub, shower and hair dryer. The rooms all have air conditioning, ceiling fans and chairs to just sit and enjoy the view. Note: Rate is applicable for 2 People. Add $15 for each extra person. This smaller room is much smaller than the standard Queen room. It is great for a single traveler or 2 people on a tight budget. 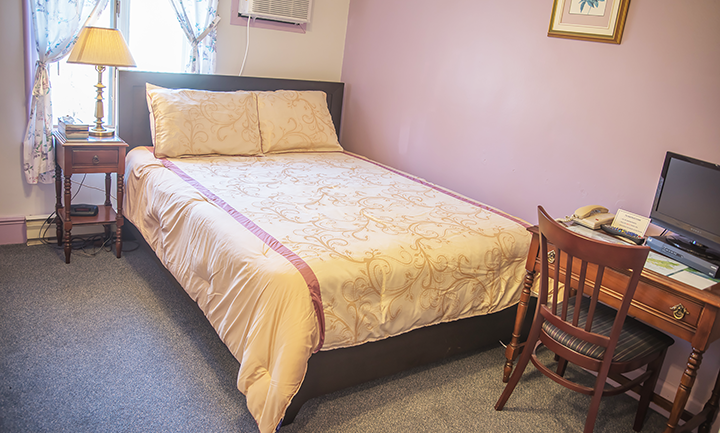 You'll enjoy a full Queen bed with a nice firm mattress and plush pillows. 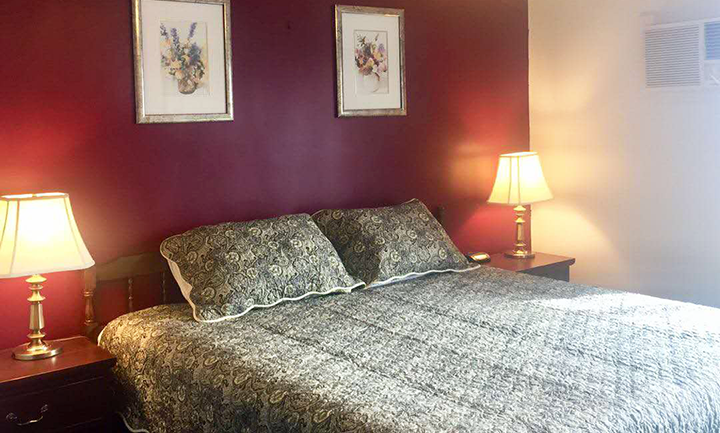 You can relax in peace after partaking in the many adventures around our community. 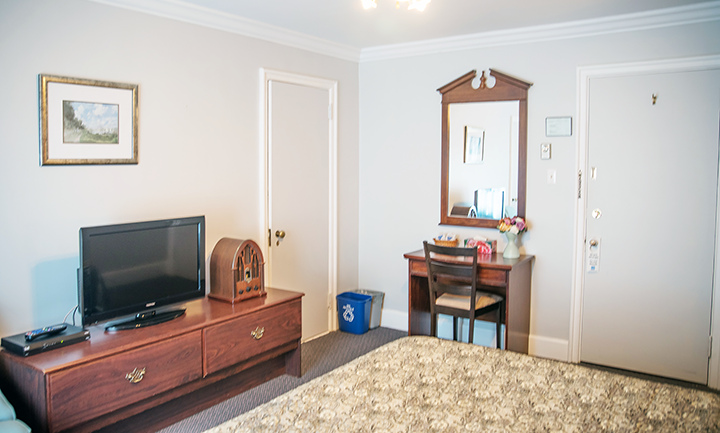 Enjoy the satellite television in the room or access the hotel wireless internet. Although the room is smaller, you still have access to all of the amenities of the hotel. 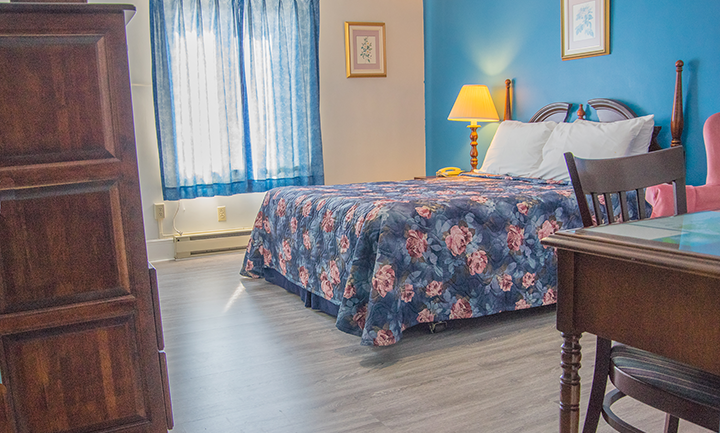 For a lower price, you are still walking distance to all the attractions of downtown Pictou. These rooms do not have harbour views. Note: Rate is applicable for 1 Person. Add $10 for second person.